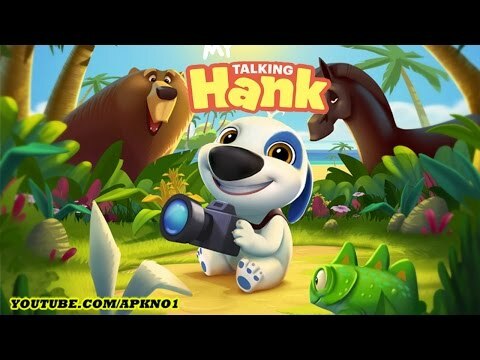 This time we will be talking about a very cute puppy in a game called My talking Hank published by Outfit7 Limited. Let`s not delay. Hank is a very cute puppy. Seriously, just looking at the icon for My Talking Hank is going to make you fall in love with him. Such cuteness means you’re going to find this game more endearing than maybe you should, but that ties neatly into the entire concept of the ‘My Talking’ series of games. They’re cute if not entirely gripping. My Talking Hank aims to counteract that by giving you a reason to check in often – collecting animals! It sort of works, too. On the one side, My Talking Hank is all about looking after your puppy, Hank. He needs feeding at regular points, as well as taking to the bathroom, and putting to bed. It’s easily done. In each case, you tap on the relevant icon and leave Hank to do what needs doing. Hank roughly knows what he needs to do, so you won’t slip up. When feeding him, you can choose what food to offer him, but otherwise, it’s really quite straightforward. Let`s continue to talk about our little fella and see the gameplay. Where My Talking Hank offers much more depth is in terms of collecting animals. Don’t worry, not in a ‘caging zoo animals’ kind of way. Nope, we’re talking photographing them. An arena near where Hank lives offers plenty of places to attract animals. You do this by placing toys and food around, luring the animals in. Once there, you snap a photo of them and add it to your entry. Obviously, things aren’t quite as quick and simple as this. Different toys and food attract different animals. As you play, you gradually learn what works for which animal. Generally, the more you spend, the rarer the animal you lure in. It’s fairly hands-off in its way, but it’s quite cute. My Talking Hank is a really cute game and I think that you should try it.